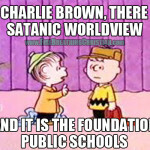 Last week in Yes Charlie Brown, there is a satanic worldview…and it’s the foundation of American public schools, we covered a Kentucky elementary school’s omission of a particularly Christian portion of its production of A Charlie Brown Christmas and how local parents responded with the typical “shock”, “horror”, and “outrage” that we’ve all come to expect for decades now from “Christians” in America…you know, the kind that inspires a whole lotta noise, drama, and the occasional bit of media coverage, but never seems to result in the noisiest and most dramatic “Christian” parents actually removing their children from a system that they – and we – all know is openly consecrated to an explicitly anti-Christian approach to the pursuit of knowledge (AKA “education”). Before I go any further, let me say that my heart goes out to the folks in these pictures. They – and, under their watch, their small children/grandchildren – are in a very bad place. Even so, there but by the grace of God go I (or any of you), so before we go and get all uppity or arrogant about anything, let’s check our motives and spirit so that we might make some very hard – and very necessary – observations about all of this in a manner that demonstrates true love for all involved, including and above all else the very Jesus who “is the reason” for the season, just like the sign says. I have no doubt that these folks care deeply about their children in the sense that they have great passion and emotional attachment where their kids are concerned. 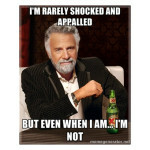 No doubt at all. I do not question in the slightest their feelings. I’m sure they’re intense. I’m sure they’re powerful. I’m also sure that their feelings and emotions – like my feelings and emotions – are anything but the best standard by which we ought to measure things. Emotions, like anything else, are easily manipulated when untethered from the Nature of God as revealed in His Word. This is when emotions, passions, and feelings become self-defined, self-serving, destructive, and dangerous. 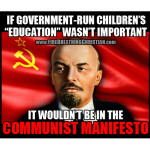 …which is, we should note, why the satanic model of education openly aims to detach everything from explicit connection with and subjugation to Christ. With math, language, art, history, science, and the like severed from Christ, they are then tools to be used in exploring, understanding, and building a world that is at least perceived to be severed from explicit, detailed dependence upon Christ. The idea isn’t complicated at all: Dismiss Christ and exalt man; reject the necessary lordship of Jesus over math, art, history and the like while imagining that man can rightly pursue and advance his understanding and application of these things apart from Christ. That’s the satanic model of education in a nutshell. 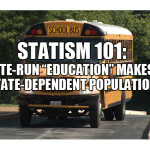 It’s also the American public school model of education in a nutshell. And even many of the professing Christians in America who freely (and often happily) ship off their little 5-, 6-, 7-, and 8-year-olds off for daily anti-Christian mind- and worldview-sculpting know it. They just don’t care. Not enough to stop, anyway. Oh, they care enough to talk and protest and howl and sometimes even march or picket holding signs about how “Jesus is the reason” for the season, but do they believe that Jesus is the reason for (and goal of) math, science, art, language, history, logic, economics, and law? 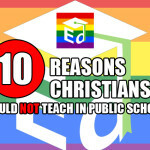 Because that’s what they’ve been discipled to believe about “the real world” in part through their own time in the State-run satanic “education” system. 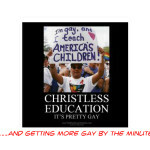 Is Jesus the required core of children’s education in all things, as His Word makes perfectly plain? What are you, some kind of religious nut or something? Or, put another way: What are you, an actual Christian who actually honors and obeys the Word of the God you actually believe to be God in practice and for real right here and now? Apparently the crystal clear inclusion of Jesus in A Charlie Brown Christmas is vital and essential. But what about Him being revered, honored, and pursued as the necessary centerpiece for any serious study of art, math, history, language, and science? Uh, no. Not so much. All o’ that is entirely unnecessary. But A Charlie Brown Christmas…that’s where we must stand. That’s the hill we must fight over. 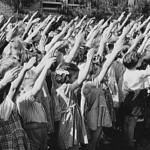 So when we see emotive, passionate, proud American Christians parading Christian-ish sounding slogans under a nice, big American flag, while doing everything they can to prop up and enable the American State-controlled system of satanic indoctrination known as “public schools”, let’s pay closer attention. Let’s think critically. Let’s care. Let’s actually read and test those slogans. 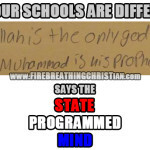 If this is “one nation under God”, and that God has spoken clearly and with specificity on the subject of Christ as the essential core of children’s education, then what are we saying when we claim that God with our lips while openly rejecting His life-defining Word in practice? 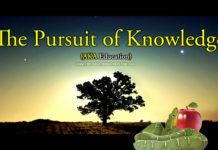 Which God (or god) are we actually worshiping and obeying around here in educational practice? Can we credibly claim to be “standing for Christ” by handing our children over to the State for overtly satanic worldview immersion in direct violation of His loving and life-giving Word? Can we coherently claim to be “standing for Christ” by fighting for His inclusion in A Charlie Brown Christmas after agreeing to ditch Him as the clear and essential core of art, math, history, language, science, logic, and law? Do we really imagine that this is all somehow going to work out well in the end? Do we really imagine that our children aren’t noticing that our professions of Christianity are hollow? Do we really imagine that our children don’t see that we have no interest in submitting to the Word of God when it conflicts with our traditions or feelings? Or maybe we just don’t really care about the practical, real world impact of a satanic “education” system upon this and future generations, because “Jesus is coming soon. Are you ready?” Just “get saved” and let the rest of Scripture roll off your back and into the trash bin. 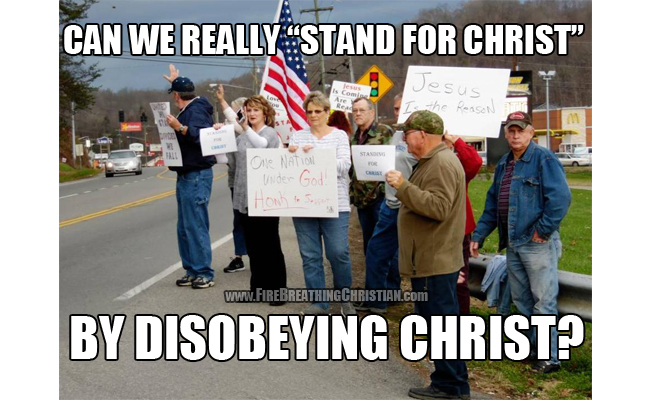 Who cares about obeying Jesus here and now? Who cares about doing what He has commanded? The sad and necessary-to-confront-out-of-love reality is this: Most American “Christians” adore the thought of Jesus as Savior while despising the thought of Him as Lord in practice and in detail. 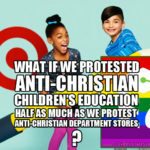 This is why we end up protesting schools for removing Jesus from A Charlie Brown Christmas while not batting an eye at the satanic foundation of everything being taught through the State-run education systems that we cherish, adore, and defend. May God help our children. 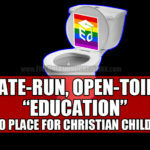 Will Obama’s decree of open toilet education finally wake up Christian parents and inspire an exodus from public schools? One of the reasons that Christians don't realize the errors they're making Scott, is because they've never been taught the truth regarding His Lordship. It is perhaps the one thing that is keeping God from visiting upon us the righteous rear-end kicking that we deserve. They read the Great Commission to go out into the world and make disciples, but fail to read the PREAMBLE to it in Mt 28:17. "All authority in HEAVEN AND IN EARTH is given unto Me…" They either ignore it completely, OR they conveniently skip over that part about 'in heaven AND in earth" because the pre-millennial worldview is all that's ever taught in Christian Churches. I see the solution as simple: get rid of pre-millennialism as a Christian worldview and the obedience will eventually follow.